Our value this half term is Justice. In class worship, class 4 were thinking about trust. We had to trust our partner to guide us around the cones! Have a look at the videos below! Remembrance Day! As a school we joined together to remember those who sacrificed their lives for our freedom and for those still serving today. We will remember them. Amelia played 'The Last Post' in our Remembrance service. Thank you Amelia! Worship Group made chocolate apples to sell in church at the Harvest Celebration. The Twelve Days of Harvest. An apple on a lolly stick! Thank you Worship Group for leading the prayers. Classes 7 and 8 have been busy not only rehearsing for our Harvest Assembly in Church on Friday, but also making chocolate apples on lolly sticks. Some of the apples are from our own apple trees we grow in our garden. We have sold them during break-time as we are using this enterprise opportunity to collect money for Bishop Julian's Fund to help young children in Zimbabwe. Apples will be on sale during Wednesday and Thursday break time for 50p. Mrs Hoole has also been busy by baking delicious flapjacks and cakes using the plums from our own plum trees. Thank you so much Mrs Hoole and the children for donating time, talent and resources to collect for this charity. Today, the whole school have been involved in activities with our church. The Infants have enjoyed Bible stories and activities whilst KS2 all visited the church. We wrote prayers, discussed 'The Prodigal Son' and sang our hearts out in celebration. Thanks to all the leaders at church who made it a fantastic experience for the children. The whole school said a sad farewell to our Year 6 children today in St. Peter's Church. We sang our leavers songs and listened to prayers written by the Worship Group who wished us well on our next journey. Father Peter told us how 'Goodbye' really means 'Go with God'. The Church has given every Year 6 child a Bible to treasure and Worship group also handed out bookmarks to remind everyone about 'Love, Challenge and Inspire'. Our NEW worship banner! Everyone has made a butterfly for our new banner! Well done children! Dan from St Michael's led our Palm Sunday worship. Class 4 showed us thatJesus did lots of amazing things during his life. Everything he did do was to show how much he loved us. 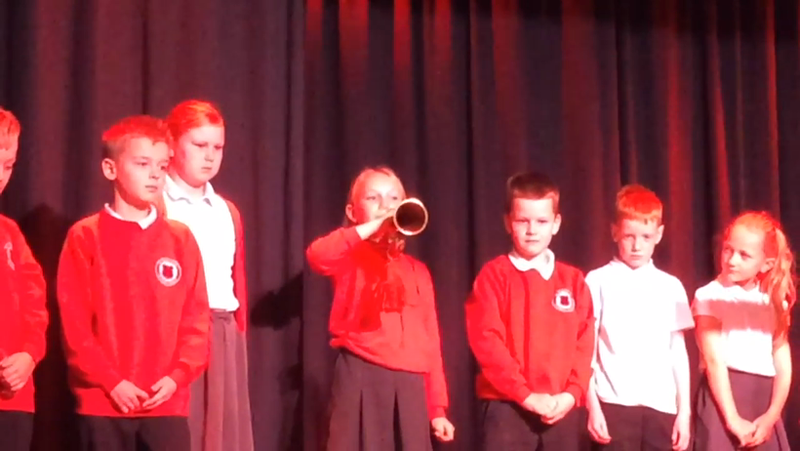 Class 11 delivered a thoughtful and deep assembly about 'The Story Behind the Poppy'. The stage was hung with poppies and then the children told current stories behind the poppies about service men and women today. Their moving story about purple poppies highlighted the work of animals during wars including 'Sasha' the bomb sniffer dog and 'Warrior', a true life war horse from the First World War. Year 6 recited 'In Flanders Fields' by John McCrae and 'The Target' by Ivor Gurney to exemplify the moral and personal turmoil war can bring. Our own poems and powerpoints for 'The Story Behind the Poppy' can be enjoyed in Class 11's page. Well done Class 8 for a wonderful assembly retelling the story of Jonah and a surprise appearance from Spencer Bear! Thank you to Class 7 for a fantastic assembly on friendship. Individual children took up the Autumn Harvest Art challenge to forage and make Autumn artworks especially for the Harvest display. Harvest! We had special guests this harvest to taste the soup classes 7 and 8 made! Thank you to all our families for the wonderful gifts! To help Classes 7 and 8 with their Harvest enterprise, Class11 have made toffee apples to raise money for the Bishop's Harvest Appeal. We harvested the school's apples then dipped in chocolate and sprinkles. We earned £16.00. This will help children in Malawi. Class 4 supported the Bishop's Harvest Appeal by decorating gingerbread men and selling them within the class. Worship Group made apple pies to support the Bishop's Harvest Appeal. We used apples grown in the school garden and sold the pies at church. In Class 3's classroom worship we thought about harvest! We wrote prayers to thank God for what we have. We asked God to look after people. We thought about "Love, Challenge, Inspire"
We told the Bible Story "The Great Catch Of Fish". Jesus loved, challenged and inspired others. Love, Challenge, Inspire! Class 10 have created clay sculptures to show our love and support we share at St Peter's. Can you spot the sculptures called 'Let everyone have their time to shine' and 'We are family?' This symbolises the values we hold here! This is Faith. She is looking for God. Faith (named by the children) introduces our assembly theme each week. She picks a special child at the start of worship to be her helper. They pull symbols and items from her sack to give clues as to what we will be learning about. Faith is on a journey searching for God (hence the binoculars!) and we are going along with her! This is our overview of the areas and topics we will cover over the next 3 years during worship. Alongside these topics we will also cover special events and other themes and issues relevant to the school and as a reflection of world events. Other faith celebrations, such as Diwali, will also be covered during Worship. The Old testament leads to the Birth of Jesus. To help lead us in worship we also have ministers and special guests in to speak to us and share in prayer. These include Father Peter, and The Inspire! Worship team. As a school we also sponsor 3 guide dogs, which began during our Disability Awareness Week in Summer 2013. They come in frequently to visit (along with their trainers! ), who give us an update on their progress. Every class also leads 1 worship a year, linked to the week's worship theme and their own RE work from in class and leads in a Harvest or Christmas Celebration. Parents are always invited along to share in these special assemblies. Worship Group also take part in Sunday services at our Church. At special times throughout the year we also take the whole school down to St Peter's Church to celebrate our worship there. Many classes also visit the church as part of their RE work to learn more about the building and different services that take place there. Class 7 led a worship on trust. Class 7 presented the new game show TRUST OR NO TRUST! What did the characters from the Bible decide to do? Did they trust in God? Class 6 led a fantastic worship on truthfulness. Many people (including teachers) faced the lie detector. We heard about many characters from the Bible who didn't tell the truth and they soon realised they had not done the right thing. This week we have explored the value of friendship. We started our week thinking about Jesus and his disciples. We looked at the importance of friendship and the qualities of a good friend! What are the qualities of a good friend? Class 2 showed in their wonderful worship presentation the importance of forgiveness. Class 2 retold the story of Zacchaeus and how his life changed after Jesus asked to visit his house for tea! It is hard to forgive others but Jesus always did this and we should follow his example. Thank you Class 2 for a wonderful worship. This week our focus has been on peace. We have thought about symbols of peace. How can we share peace with one another? Mrs Wright has set the challenge to identify an organisation or charity that use a dove as a symbol of peace? Write it down and give it to Mrs Wright!